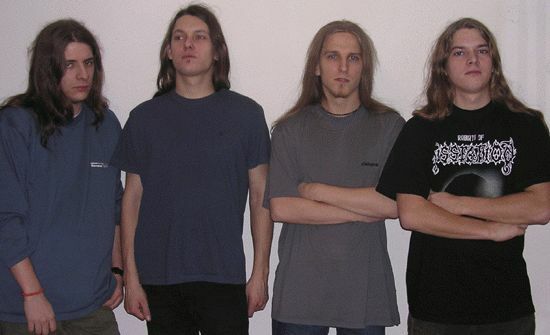 The band was formed in 1997, with the following line-up: Ruszti Zsombor - vocals, Barti Zoltan - Bass, Kliment László - Guitar, Kliment Márton - Drums. Megazetor started to play music at these times, so the style has changed a lot since then, as they were becoming more and more skilled musicians, but the aim was always to play complex but melodic death-metal. After a few attempts, the band managed to record their first demo, "Reflections Of Hate" in 2001, with 5 songs. Then musicians decided to get another solo guitarist, so Erdélyi Péter joined the band. They rewrote some of the songs exploiting the possibilities given by the two guitars, adding some extra harmonies and solos to the songs, In 2002, the band recorded its second demo, " ..when death shall have no dominion..", which included three tracks, a brand new song and two older ones in a rewritten form. Not much later, Zsombor left the band, but Megazetor didn't want to find a new singer, so Zoli and Peter became the vocalists. This line-up hasn't changed since then. The band had a lot of concerts in 2003, they've played in several places all around the country, in Slovakia, and on the Sziget Festival, too. In January, musicians organized a Death-tribute concert to the memory of Chuck Schuldiner, their greatest musical influence, with the contribution of a few guest musicians from other local underground bands. They performed more than a dozen Death songs in one and half an hour, and the show was a great success, so guys decided to do it again. This happened one year later, in the february of 2004, in an extended form as more guest musicians and bands appeared and more Death songs were performed live than the before. Following this concert, the band entered into the period of intensive song writing and refining, as we were preparing to record a new material in the summer of 2004. Finally, the recording sessions took place at studio Denevér, in Szolnok. After finishing the designing and printing of the cover, new EP, called ' The Drug You Daily Crave ' , with four new songs was finally released in november, 2004, in self-financed production. Megazetor distribute this EP by themselves for the time being, but musicians hope to find a proper label soon.